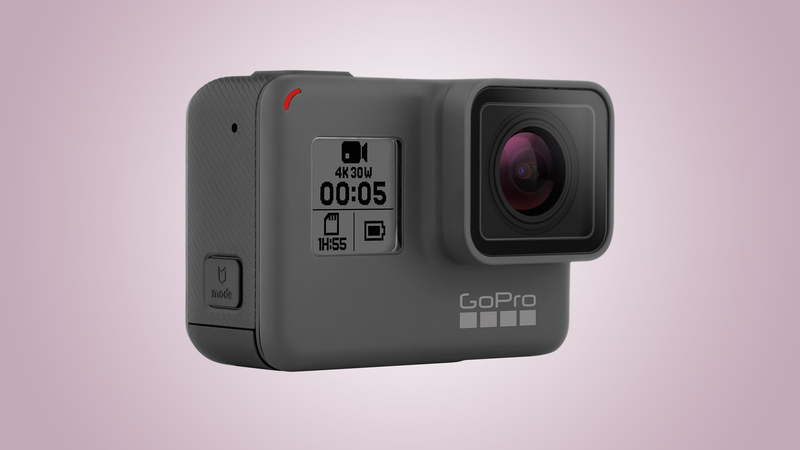 Everyone knows that GoPro makes the best action cams (or POV cams) for extreme sports enthusiasts, and that the GoPro Hero5 Black is what everyone’s using to shoot 4K at 30fps. Everyone, that is, except Yi, which is tackling GoPro head-on by matching a lot of the specs of its rival. Ultra-detailed 4K at 30fps and smooth 1080p at 120fps? Yup. 12-megapixel stills? Check. And, at around $169 / £159 it’s almost half the price of a GoPro Hero5 Black. 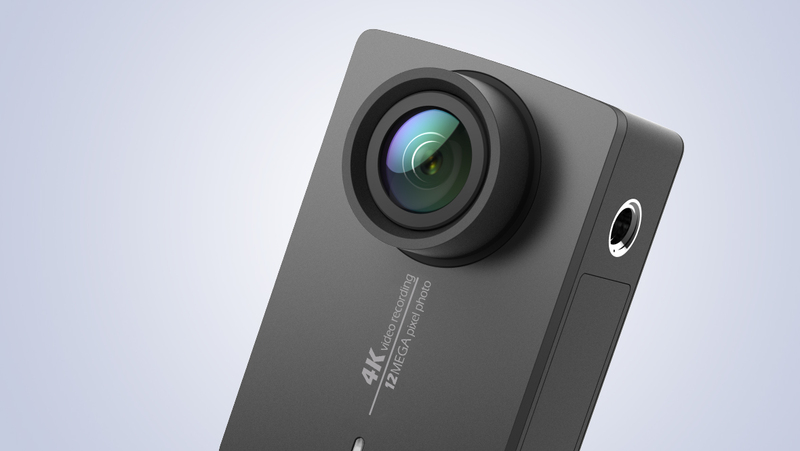 Has the Xiaomi-backed Yi done the impossible with the simply named Yi 4K Action Camera? 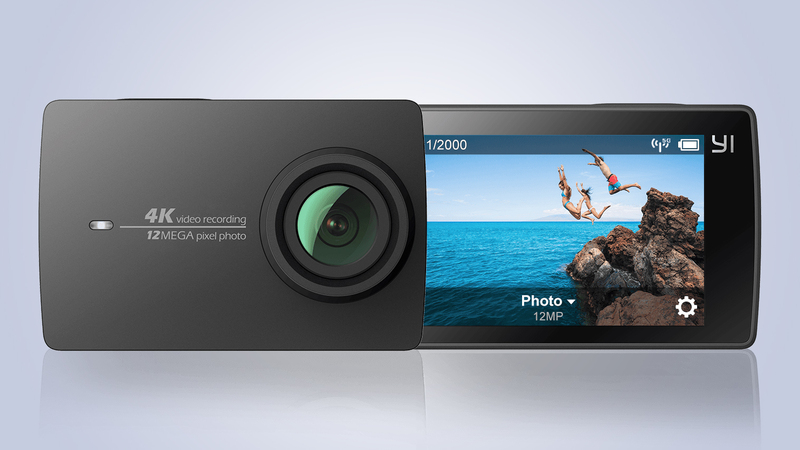 With a touchscreen user interface, one-button control, Wi-Fi Direct for connecting to a Yi Action phone app, and plenty of video resolution options all the way up to 4K at 30fps (for 120 minutes continuously), the Yi 4K Action Camera is an appealing all-rounder. The fixed lens offers a wide field of view and a fast f/2.8 aperture, and you can also take photos while recording video (though only via the app), cue up 4K timelapses and slow motion sequences, and loop record for a specified time. Manual adjustment options are exhaustive, but it’s generally easier to ignore most of those and just go with the default settings. Not surprisingly the Yi 4K Action Camera is all about taking on GoPro, but it slightly pre-dates the GoPro Hero5 Black; this effort is about matching the GoPro Hero4 Black spec for spec. In some areas it’s a little behind the times when you look at the very latest features found on the Hero5 Black, although we’re talking about features that you may not even want (step forward, voice control). And depending on your preferences, the YI 4K still has some notable advantages over the GoPro Hero5 – it’s got a larger touchscreen at 2.19 -inches (that’s 330 pixels per inch), it’s 22g lighter at 95g, its battery lasts much longer, and it’s cheaper. 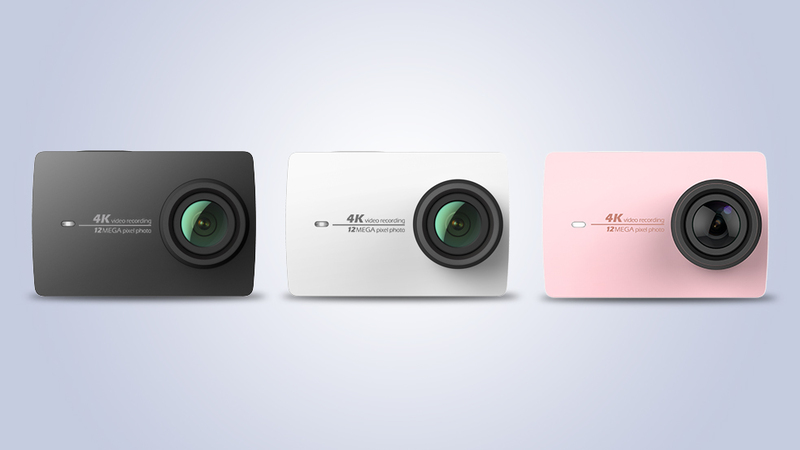 Aesthetically, the matchbox-sized Yi 4K Action Camera is conventionally sleek in either of the three color choices: matte black, white, and rose gold. A tough plastic look is the order of the day here. On the right-hand side as you look at the front of the camera is the lens, which slightly protrudes. On the underside is the lid for accessing the battery compartment – this houses a 4.4V lithium-ion 1400mAh power pack, which compares well to the 1220mAh inside the GoPro Hero5. Alongside it is a microSD card slot; YI recommends a variety of U3-class micro SD cards, though Class 10 and U1 cards work just as well in practice; a 64GB card will give you about 80 minutes of 4K recording. The extra real estate offered by the 2.19-inch screen does make onscreen menus easy to navigate. It’s also reasonably sharp. It offers readouts on the shooting mode it’s in – video or photos, with an indicator of the resolution, too – as well as an icon for the remaining battery charge. Along the top, sandwiched between two microphones, is a single button that both switches-on the YI 4K Action Cam, and activates and deactivates recording. Accessories appear to be widely available online. You can also protect your YI 4K Action Camera with a leather cover and lens cap cover bundle for $19.99/£16.99, though only the lens cover is practically necessary; the native casing itself is sturdy enough. Semi-pro users might want to consider the YI Handheld Gimbal ($280/£225), which offers three-axis pan/tilt/roll through 320 degrees. Pet owners may want the YI Pet Mount for US$33.99 (Ali Express shows the YI 4K strapped to a cat). Smooth, solid and well constructed, the YI 4K starts up inside a second; there’s another delay of about two seconds before it’s truly ready to go, but that’s still impressive, and very useful on an action cam. The one-press shutter makes the YI 4K easy to operate – in fact it’s arguably too easy, as the button is exactly on the spot where you’d naturally pinch the camera to pick it up, making it almost inevitable that you’ll depress the on/off button by accident. So at some point you’ll probably create a five-minute 4K video of the inside of your pocket, as we did, which could potentially leave the battery drained. Unlike the GoPro Hero5, the YI 4K Action Camera is not waterproof, and there’s no waterproof case included – that accessory will cost you $39.99/£30.99, and it’s good to a depth of 132ft/40m, although it effectively renders the touchscreen useless. The standard tripod thread on the camera’s underside is a nice inclusion, although once it’s mounted the fixed 155-degree field of view does feel slightly restrictive. There are enough creative modes to keep most filmmakers happy – loops, timelapses, slow motion (1/8, 1/4 and 1/2-speed), a countdown timer, and a 30 fps burst mode are all here. 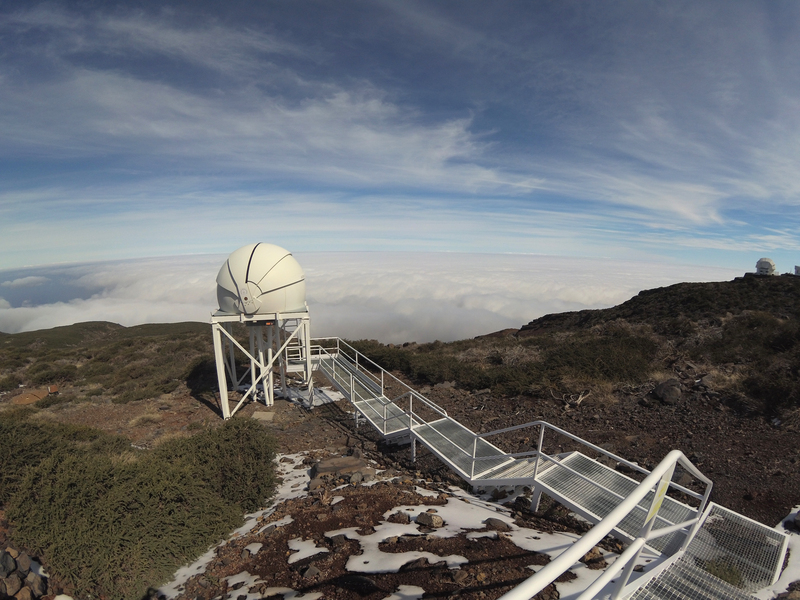 We tested the YI 4K Action Camera in a variety of situations, from indoors to around Westminster Palace in London, and while hiking among the mountain-top telescopes of La Palma in the Canary Islands. The YI 4K creates its own Wi-Fi Direct network, so you just need to find it on a phone before launching the excellent YI Action app. 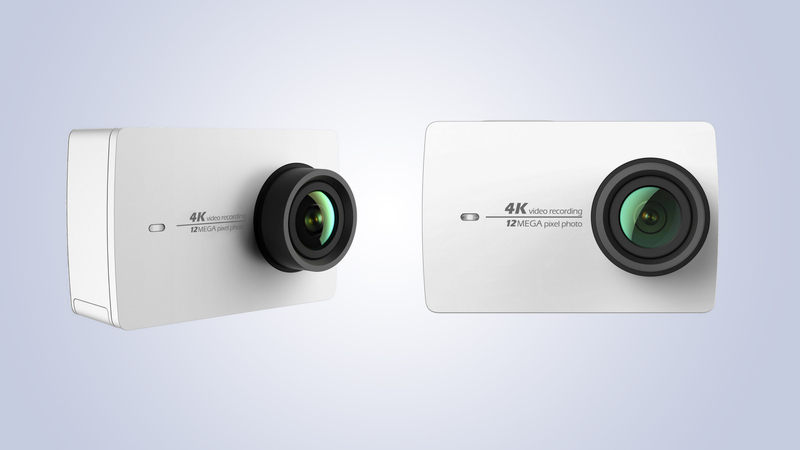 Although the app streams a live view from the camera to the phone, that’s largely not necessary given the YI 4K’s touchscreen, which can also be used to make adjustments to all the core settings. A settings dial gives you access to on-screen menus for the camera or video functionality, depending on what’s currently activated. There’s a mess of resolutions and qualities to play with, perhaps too many; the very highest resolution video is 4K at 30fps, with video quality set to high, while you can go right down to 480p, though that does come with the advantage of a whopping 240fps. For photography, 12 megapixels is the top choice, though sadly there’s no raw format option. The likes of white balance, ISO, exposure compensation and metering modes can also be tweaked for both video and photos, and the on-screen menus are bright, easy to understand and work very quickly. However, there’s no voice control on offer, unlike on the GoPro Hero5. Although there are a lot of settings to experiment with, the auto settings on the YI 4K Action Camera work really well – anyone can use this action cam. One caveat is that you can only film footage in 4K at 30fps if you set the output to NTSC video in the camera’s settings – 25fps is as far as you can get using PAL. Either way, a low-resolution (848 x 480 pixels) version of every video you take can be downloaded to a phone for easy sharing online. The 4K 30fps footage is sharp and colorful, though panning does produce some jerkiness, also revealing distortion in the corners and tops of images caused by the YI 4K’s fisheye lens. Lens distortion correction (LDC) is available, but it wasn’t hugely successful in our tests. However, the lens is great for capturing wide-angle vistas; you’ll see quite a bit of lens flare of you get the sun in shot, but that’s normal for a fisheye lens. While you wouldn’t expect the sensor in the YI 4K Action Camera to produce pin-sharp night sky images, it’s not particularly good in low light, despite claiming automatic low light detection and frame rate adjustment for such conditions. Softness, noise and a lack of detail are typical in images captures around twilight. Similarly, indoor footage tends to be dark unless you tweak the ISO, and photos in general look rather dark. The spot metering system does a decent job of adjusting the exposure as you film, but the built-in electronic image stabilisation (EIS) is less impressive. As such, handheld video is a little too jumpy (noticeably more than on a smartphone), while fast-moving action footage can be difficult to watch at 30fps. We recommend using the YI 4K on 4K 30fps when you want to mount it on a small stationary tripod to film a landscape in bright conditions. For action footage, there are better choices; retreating to the step-down 2.5K resolution isn’t much good, since you get the same 30fps in a narrow 4:3 aspect ratio, something that also hampers the 1440 option. A good compromise is the 1080 setting, which delivers Full HD footage at 120fps; it’s smoother and much more comfortable to watch, and will be sharp enough for most uses. The YI 4K Action Camera doesn’t offer raw shooting, as the GoPro Hero5 does, but it has a similar no-computer-necessary appeal. To connect to a phone for transferring photos and video, it’s first necessary to download the YI Action phone app and connect to the camera’s own Wi-Fi network. A ‘connection succeessful’ message appears, after which two options are presented: remote control and library. Remote control allows you to flip between loop, timelapse and live view modes, the latter allowing you to take photos while recording video (something you can’t do if just using the camera). 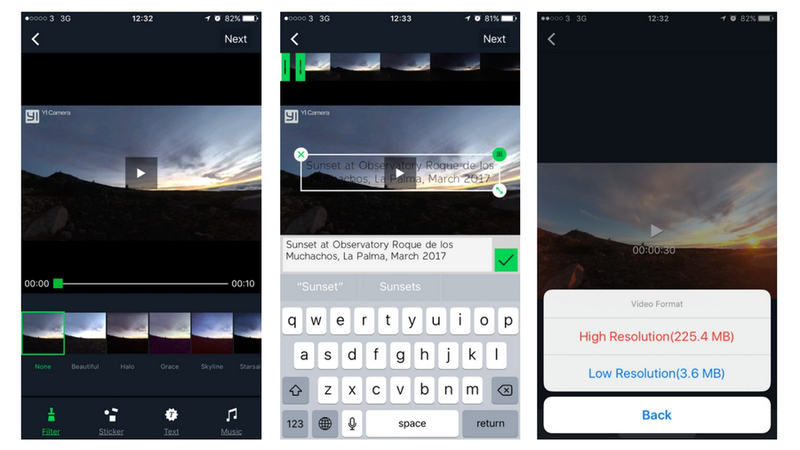 The library lays out the images and clips you’ve captured, and gives you the option to transfer high-resolution or low-resolution versions to your phone – for a three-minute video shot in 4K 25fps, that’s a choice between 1.5GB or 27MB, so it’s worth making. You can download the high-resolution files to your PC later by attaching a micro USB cable to a port on the YI 4K’s side. The app itself makes it really easy to trim a video, tinker with the speed, add Instagram-style filters and even add captions and text to the file before sharing it via Facebook or Line (the presence of the latter social networking app betrays the YI 4K’s Asian origins). However, you can just as easily download the video file to your phone and share it on whatever social media platform you want. As a bonus, you can choose between a 2.4GHz or 5GHz connection; the former is best for remote control and livestreaming, while the latter allows super-fast file transfers at a shorter range. How often do you take an action cam underwater? Most people never will, and YI clearly thinks that scuba divers will be happy to stump up for a waterproof casing whatever brand of action cam they choose. So in some regard the YI 4K ActionCam is about some cutting corners, but what it leaves out – GPS, voice control, auto-upload, and raw shooting – are hardly core features. In fact, it gives as much as it takes, with a large and responsive touchscreen, a big battery and a fast file transfers all good reasons to consider the YI 4K. It may lack a few niceties – and we would include lens distortion correction and image stabilisation in that list – but the YI 4K Action Cam remains a great value addition to any adventurer’s kit bag. The Hero5 Black is a great reminder of why the name GoPro is so revered and why it’s still our top action camera pick. Simple to use, the addition of a rear touchscreen, voice control and GPS make it one of the most feature-packed cams currently available. 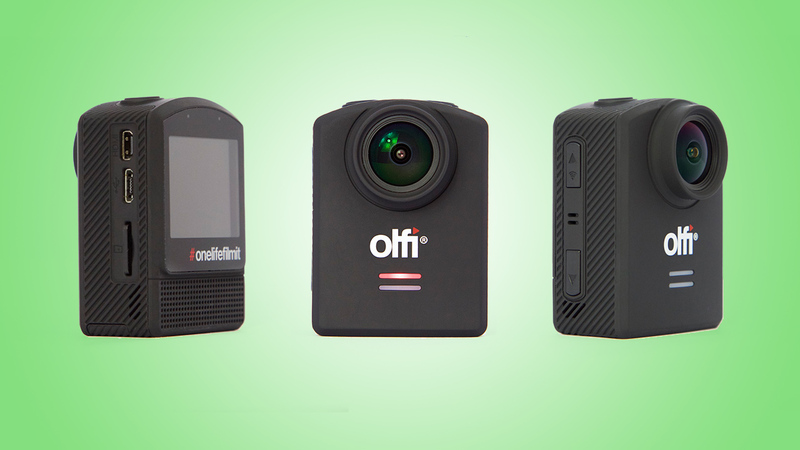 If may lack GPS, voice activation and the ability to link external sensors, but for those who simply want to capture good-looking footage without breaking the bank, there’s very little to complain about.